Skilful Retreat Conducted by Foch De Castelnau's Lorraine army was still in peril, however, and a further withdrawal across the Seille and Meurthe rivers and thence into France, was decided upon. The army was ordered to fall back to a new position on the French side of the frontier, covering the Trouvée de Charmes, a gap in the Eastern fortress barrier, with the entrenched camp of Toul on its left and that of Epinol on its right. In co-operation with Dubail's First Army, they would there await the inevitable attack by the victorious Germans. Foch's 20th Corps was assigned to act as the rear guard of the whole army, covering its retirement across the Meurthe to the new battle positions. A welcome reinforcement reached the Second Army on August 21, made up of three brigades and several batteries of artillery belonging to the 9th Corps which had mobilized at Tours. The retreat across the frontier was begun on August 21. Gen. Foch, with his "Iron Corps," guarded the retirements, holding the heights on the left bank of the Meurthe above and below St. Nicholas and covering the river crossings with his artillery fire. On the right bank, a brigade of the llth Division, with several batteries, held the heights above Flainvol against repeated attacks, and only withdrew across the river at dark, blowing up the bridges as they went. The only French troops left on the right bank were those that held the Grand Cauronne. On Sunday, August 23, the Second Army was in position on its chosen battle ground for the defence of the Charmes Gap. On the same day, Lanrezac's French army on the Sambre was defeated by von Buelow, the British had begun their retreat from Mons, the armies of De Ruft'ey and De Langle had both been shattered and the whole Allied line on the Northern frontier was falling back. Donan heights in Alsace and the neighboring line of the Vosges, and Gen. Pau was withdrawing from Mulhousen. Both were ordered to unite with Gen. de Castelnau in front of Trouvée de Charmes. Sunday, August 23, found the armies of Castelnau and Dubail standing in battle formation in front of the Trouvée de Charmes, the 20-mile gap opening in the side of France, near Nancy, flanked on its northern end by the fortified Meuse heights and on its southern end by a fortified spur of the Vosges. De Castelnau's battle line, with its left on the heights of the Grand Cauronne and extending southward toward Essey, formed almost a right angle with Gen. Dubail's line, which ran from Essey by way of Baccarat to the Vosges. The German advance, therefore, must either be frontal against one army, exposing a flank to the other, or else form a salient enveloped by the French from the outset. Including the terrain swept by the guns mounted in the forts of Toul and Epinol, the front was 45 miles long. The Germans, after occupying Luneville on the 23d, advanced toward the Gap and gave battle on the following day. A corps of Gen. Heeringen's army made an attempt to turn Dubail's flank by forcing the Pass of St. Marie in the Vosges, but was repulsed by the 14th French Corps, reinforced by troops from the garrison of Epinol. At the same time, two corps of Bavarian troops had pushed along by the Meurthe valley and engaged the 21st French Corps at Celles and Baccarat, but still the line did not budge. The main attack was made against De Castelnau's front. Advancing across the Mortague valley on both sides of Gerbeviller, the Germans flung themselves in dense masses against the positions held by the 15th and 16th French Corps, but the men of Provence and Languedoc amply retrieved their failure at Morhange, resisting every attack. On the right of them, Conneau's cavalry fought dismounted. Here the attack was pressed furiously for hours, but in vain. Now began a terrific bombardment, shells and shrapnel raining upon the Plateau, but it could not disperse the indomitable Frenchmen. The German assault having failed, Gen. de Castelnau resolved to launch a counter- offensive, in charge of Gen. Foch. In addition to his own 20th Corps, Foch was given command of the 70th Resei*ve Division and two brigades of the 9th Corps. Foch hurriedly planned a turning movement against the German right flank, with the heights beyond the Sanon as his objective, thus cutting the German communications and endangering their whole position. Under cover of the guns of the Grand Cauronne, Foch led his 20th Corps, first across the Meurthe by bridges, and then against the heights of Sanon, while the other detachments, under Gen. Fayolle, were pushed forward toward the Luneville-Chateau Salins road, north of the Marne and Rhine Canal. Seeing their danger, the German defenders of Sanon called for reinforcements, but the whole German army was by now wholly engaged repelling the counter-offensive, and no troops could be spared. Before nightfall, Gen. Foch had reached the heights beyond Sanon, had stormed Flainval and the neighboring villages, and cleared the wood of Crevic of the enemy. Gen. Fayolle, with the 70th Reserves, had co-operated splendidly, having advanced within 2!/> miles of Serres on the Chateau Salins road. few hours, but this was fatal to his main battle line, which showed signs of weakening. When the German front began to waver, Gen. de Castelnau ordered a general offensive. The French attacked from three directions, compelling a retreat of the Germans through the wide gap between the Chateau Salins road and the Vosges. They fought stubbornly as they withdrew, but in three days they were driven across the German border, with heavy losses. This was the first great victory won by France, and coming so soon after the defeat at Morhange, it filled the nation with joy. The generalship displayed by Gen. Foch in that victory entitled him to promotion. Summoned by Gen. Joffre to Chalons, he was complimented for his work at Nancy and given command, not of a corps, merely, but of an army—the immortal Ninth French Army—which was to be hastily formed out of army units then retreating from the Belgian border, and destined two weeks later to win imperishable glory as the real victor of the Battle of the Marne. The German casualties in the Battle of Nancy are said to have reached the astounding total of 250,000, and this disaster to German arms was brought about by a French force but little more than half as large as the Germans. Their Retreat Towards the Marne Leaves British Forces Isolated at Mons ' SECTION 6-1914 »— ""
whelmed by the German flood along the Belgian and Luxemburg borders. At this time there were four Allied armies in alignment on the French frontier—Sir John French's British Expeditionary Force near Mons, Gen. de Lanrezac's Fifth French Army near Charleroi, Gen. Langle de Carey's Fourth French Army north of Sedan, and Gen. de Ruffey's Third French Army holding the pivot position near Verdun. As a preliminary to his plan of driving a wedge in between the armies of von Kluck and von Buelow, and uniting with the Belgian army at Brussels, Gen. Joffre had sent strong reinforcements to Gen. Lanrezac, ordering him to proceed through Charleroi and flank von Buelow's army. While Lanrezac's army was moving up to the line of the Sam- bre to give battle to von Buelow's forces, Gen. Langle de Carey's army was advancing from Sedan across the Semois River to confront the Duke of Württemberg, and throwing out detachments on the left bank of the Meuse in hopes of keeping in touch with Lanrezac on the west. Further to the east, Gen. Ruffey's Third Army was advancing on Luxemburg to oppose the German Crown Prince and raise the siege of Longwy. Unknown to the French Staff, there was another large German army, that of Gen. Hausen, lying concealed behind the forests of the Ardennes, and it was this unsuspected force that was destined to bring disaster to the Allied cause. The two German army groups, commanded by the Duke of Württemberg and Crown Prince Frederick, were at this time separated by the River Meuse, and it seemed entirely feasible to defeat them separately. The Germans, however, had outwitted the French by planting Gen. Hausen's army in reserve behind the Ardennes. So, instead of attacking seven German corps, as they had anticipated, the French encountered thirteen corps of infantry and three of cavalry. In addition, the Germans had a great superiority in artillery, aviation, machine guns, and material in general. Still unaware of the vastly superior forces which the Germans had assembled, the French forces, on August 21, confidently advanced to give them battle. Namur had not yet fallen, and indeed, the fortress was expected to hold out for weeks. The Third French Army, commanded by Gen. Ruffey, followed from the east to the west the course of the Semois River, a tributary of the Meuse. The Fourth French Army, under Gen. Langle de Carey, operated between the Meuse and the Lesse. The German forces occupied the wooded plateau, extending from Neufchateau to Palisent, which they had strongly fortified. On August 21, Gen. Langle's infantry boldly attacked the Wurttembergers, but were repulsed. Still fighting, they fell back across the Meuse River. The pursuit by the Germans was punctuated by strong counterattacks, inflicting great losses upon them. Gen. Ruffey's Third Army was similarly checked in its advance on Neufchateau by the superior forces of the German Crown Prince and was thrown back on the line of the Semois River. Both offensive actions undertaken by the armies of the French center had miscarried. Not only were they unable to lend their aid to Gen. Lanrezac, operating before Charleroi on their left, but they were obliged to retreat. The French army of Gen. Lanrezac, on the day following the battle of Neufchateau, met with defeat, because that general had failed to carry out his instructions, which were : To occupy the city of Charleroi in full force, to entrench on both sides of the Sambre River, to destroy bridges across the river, and to secure his right flank from attack. men. Crossing the bridges above and below Charleroi, the Germans poured into the city. There ensued one of the deadliest battles of the war. The thoroughfares of Charleroi at once were swept by a tempest of machine-gun fire. Great chimneys toppled over upon the combatants, burying hundreds in the debris. Hand-to-hand conflicts took place in factories, in workshops, and in the electric power station. Into this desperate fray leaped the savage Turcos and Zouaves, fighting with long sheath knives and bayonets. Again and again they forced the Germans back to the environs of Charleroi. The city became a roaring furnace and in a few hours was reduced to ruins. That night Gen. Lanrezac learned of the fall of Namur. More startling still, he was informed that Gen. Hausen, with a new German army, 300,000 strong, had crossed the Meuse River at Dinant and was moving ag-ainst his flank. To avoid being crushed between two enemy armies, Lanrezac gave orders for a hurried retreat southward. With heavy losses, he managed to reach Maubeuge, where he resigned his command to Gen. d'Esperey. So rapid was Gen. Lan- rezac's flight that he could not find time to notify the British army of his intended retreat. The losses in this battle of Charleroi were appalling on both sides. Lanrezac's Fifth Army, on retiring from Charleroi, barely escaped envelopment by these German armies. Von Buelow attacked from the north, von Hausen assailed the right wing, while /the path of retreat was threatened by a third German force. By fighting desperate rear-guard actions, and with Sordet's cavalry protecting their western flank, the Fifth Army reached Guise. Here, strongly reinforced, they turned upon their nearest pursuers, August 23, driving the Prussian Guards and the Tenth German Corps across the River Oise and continuing their retirement without hindrance in the direction of the Gap of Chimay. Langle De Carey's Fourth Army, operating along the Meuse, made a stand at Dinant on August 23. Here the Saxons, in great strength, sought to gain possession of the bridges. The French for a time retained the bridges, but later they blew them up before retiring southward toward their own frontier. The Saxons, however, succeeded in crossing the Meuse at Givet and resumed the pursuit. On the following day, August 24, the French evacuated Charleville, leaving behind a small artillery garrison whose machine guns were so placed as to command the three bridges that connect Charleville with Mesieres. As the German vanguard entered the two towns the bridges were suddenly blown up behind them by contact mines, and their ranks were riddled by the French machine guns. At the same time, the main German army appeared in view in the valley below and were greeted by a shower of shrapnel from the French guns on the hills above the town. The French, yielding to numbers, finally evacuated both Charleville and Mesieres, and retreated to Neufchateau, where they were attacked by the Duke of Wurttemberg's army. On the same day, the garrison of Toul was compelled to evacuate before the attacks of the Crown Prince Rupprecht of Bavaria. The collapse of the Meuse line on August 27 was followed by the rapid retreat of Ruf- fey's and Langle de Carey's armies, closely pressed by the three German armies of Crown Prince Frederick, Gen. von Hausen, and the Duke of Wurttemburg. A decisive action was fought on August 7 at Donchery, near the famous battlefield of Sedan. Von Hausen, moving up the left bank of the Meuse, attacked Langle in flank, menacing his line of retreat, while the Duke of Württemberg struck at his front. Against such odds Gen. Langle de Carey could not hope to prevail. Accordingly, he fell back hastily toward Rethel. Langle's retirement from Donchery exposed the flank of Ruifey's army on his right, compelling the tetter's retreat toward the wooded plateau of the Argonne. This retirement involved the surrender of the forts of Mesieres and Montmedy on the 27th. Longwy capitulated on the 27th to the Crown Prince Frederick, who advanced into France in the direction of the Argonne. Its brave defender, Lieut. Colonel Darche, had held out for 24 days against the assaults of the enemy, but the ancient fort could not longer withstand the pounding of the German guns. All the northern strongholds, excepting Maubeuge, were now in the enemy's possession. of Rethel was put to the torch. Crossing the Aisne, in hot pursuit of the French, the Germans captured Rheims and Chalons on. August 29, without firing a shot, and on the next day the fortressed towns of La Fere and Laon surrendered. The general retirement on the line of the Marne was continued, and the pursuit of the Germans slackened. By September 3, the French armies had finished their retreat and were awaiting the word that would send the Huns reeling back. WITH four French armies in full retreat on their several fronts, after the repulse at Charleroi, only the small British Expeditionary Force at Mons remained on the northern border to stem the German flood which was surging southward through Belgium. Realizing at last that he had greatly underestimated the strength of the German invasion, Gen. Joffre's immediate strategic concern was how to save the Allied armies from irreparable disaster. Of French reserves he had at most four corps, which he might send north to assist his routed aï-mies in making a final stand against the Germans. His Gallic caution, however, advised him that the situation was too fraught with danger to justify so desperate a risk. Outnumbered in the ratio of seven to four, the French forces could not hope definitely to hold the Germans in check. now would spell disaster to the Allied cause and the complete triumph of Germany. With the surrender of the French armies, Paris would fall, and the Germans could dictate an ignoble peace, both to France and England. Germany might then give her undivided attention to Russia and by annihilating the Czar's armies attain to the mastery of Europe and Asia. forward he played with the German pursuers as a cat plays with a mouse. The Germans, too dense to comprehend the strategy of Joffre, and believing that the French armies were demoralized, fell into a trap that had been laid for them. Like the army of rats that trailed behind the pied piper of Hamelin, they followed whithersoever Joffre led, and never realized their blunder until the French and British fell upon them in the immortal Battle of the Marne. At the very outset, however, Joffre's plans miscarried, in part, on account of the confusion arising from the hurried retreat of the French armies. Although the French armies on his right were in full retreat from the Belgian frontier on August 23, following their defeat first at Neuf chateau and then at Charleroi, Gen. Sir John French, the commander of the British forces, still remained in fatal ignorance of this important fact for at least 24 hours. His intelligence department appears to have functioned imperfectly. Gen. French was unaware that his little expeditionary force of 76,000 infantry and 10,000 cavalry had been left in complete isolation on the 25-mile front along the Mons-Conde Canal. 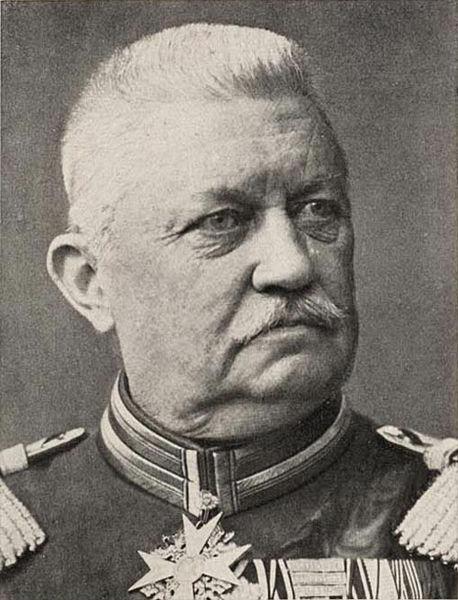 He knew nothing of the sweep of von Kluck's army through Belgium and the German intention to turn his left flank. His airmen had failed to detect the presence of swarms of German soldiers in the adjacent woods. Serene in the belief that he was supported on the right by Lanrezac's Fifth French Army and on the left by a screen of French cavalry, and confident that only two German corps at most opposed him in front, Gen. French tranquilly sat him down amid the slag heaps of the Mons region on that fatal Sunday, August 23, to await the attack of the Huns. addition, a cavalry corps of three divisions, under Gen. Sordet, rested farther south at Maubeuge, prepared to assist in any emergency that might arise. At high noon, on Sunday, August 23, while the church bells in the neighboring villages were pealing joyously and the British soldiers were variously engaged at play or in washing their soiled garments, the heavens were rent with the screech of German shells fired from the cover of the woods fronting Mons. Squadrons of German airplanes suddenly appeared, circling over the British line. The British airmen at once soared upward to give them battle. British cavalry patrols galloped in, bringing the information that the adjacent woods swarmed with German troops and heavy guns. Too late Gen. French learned that his little army faced, not two German corps, but six—a force of 300,000 Huns, as against 86,000 Britishers. Six hundred German guns were at once brought into action, drenching the British left with shrapnel, and the right of the line with bomb-shells. German airplanes, by dropping smoke bombs, gave the range for their artillery. Thus while the air battle was in progress, the infantry faced a hurricane of shells. Presently, from the cover of the woods, the German columns advanced in mass formation, a seemingly irresistible horde. Undismayed, the British veterans stood their ground, seizing their rifles and pouring a fusillade of bullets upon the oncoming squares, which melted in the heat of the British fire. As the living walls advanced, each in turn withered away before the bullet or the bayonet, until the German dead were piled breast high in places. Again and again the driven Huns advanced, wavered, thinned, and retreated to the cover of the woods, but they were as constantly urged forward under the lash of their officers, until finally they all but reached the British line. As the dense masses of German infantry worked right up to the British trenches, the firing ceased and the British cavalry charged. With a blood-curdling yell, the Huns l'an back as though the fiends pursued them. Yet as the day waned, the British trench line was wearing thin ; the awful tempest of German artillery fire was eating the heart out of the defense. Slowly but surely the British batteries were silenced. The attack had now spread along the whole line of the canal, but except at the loop on the British right wing, the Huns had made no impression. There, however, numbers prevailed at last and in mid-afternoon the Third Battalion was ordered to retire from the salient and the Fifth Division on the left to conform. After blowing up the bridges in the loop, the retreat was sounded and the Second Corps withdrew to a position on higher ground. As the right wing fell back, Gen. Chetwode's cavalry, by headlong charges, broke up every effort of the Germans to disorganize the rear. On the left flank, held by Smith-Dorrien's corps, the Germans were seeking to suffocate the British line by sheer weight of numbers. They tried also to cross the canal by bridge and by pontoons, but the English for a time prevented this by the accuracy of their shell fire. The odds were, however, too uneven ; in the end the British details holding the bridgeheads were cut to pieces, the gunners dying to a man. The bridges were then destroyed by British engineers. Foiled at the bridges, the enemy massed on the bank and tried to hold their positions. An artillery duel followed for possession of the canal bank. In the beginning the German masses were cut down by the British gunfire, but other German masses pressed on, and slowly, under frightful loss, they began to work their pontoon bridges across the smoke-clouded face of the canal. Ten times they almost got the pontoons over, and as often the British guns reduced the boats to splinters. But the heroic efforts of the British were in vain. Fresh hordes of Huns were let loose against them; their flanks were in danger ; a great turning movement was developing away to the west of Tournai ; it was time to retire. Still unaware of the overpowering strength of the German forces which were bearing down upon his little army, though the true situation might have been discovered by efficient air scouts, Gen. French was dumbfounded when Marshal Joffre notified him at 5 p. m. that three German corps were moving against the British front, while a fourth German corps was endeavoring to outflank him from the west. He was also informed that the Germans, on the previous day, had captured the crossings of the Sambre River, between Char- leroi and Namur, and that Lanrezac's army on his right was retreating. In other words, the defensive pivot of the Franco-British line at Namur, on which the Allied strategy depended, had fallen almost at a blow. By Sunday the Germans had left Namur, and, in numbers far exceeding French predictions, had seized the crossings of the Sambre and Middle Meuse and were hammering at the junction of the Fifth and Fourth French armies in the fork of the river. The junction was quickly pierced, and the French, being overwhelmingly assaulted both in front and in flank, could do nothing but retire. When the British commander received this information, the French armies had been retreating for ten hours and were a day's march removed from him. Thus the British found themselves wholly isolated, engaged in front by three German corps and threatened by a fourth German corps on their left, with the French army a full day's march away. Undaunted, and with their proverbial coolness, the British made methodical arrangements for a retirement toward the prearranged line. The hard-pressed Second Corps began its retreat at midnight, its flank covered by the First Corps with massed artillery. Meanwhile, Gen. Joifre had ordered D'Esperey's retreating Fifth French Army to turn about and counter-attack, in order to prevent the cutting off of the British right flank by von Buelow's forces. D'Esperey at once attacked the Germans, driving them back almost to the gates of Charleroi. In this brilliant engagement, the Algerian troops especially distinguished themselves, humbling the Kaiser's Prussian Guards. To still further protect the retirement of Smith-Dorrien's Corps on the left of the line, Gen. French ordered Gen. Haig to boldly launch a counter-offensive along the Mons road from Bray to Binche. The enemy were then crossing the Mons Canal in great numbers and pouring down on the villages to the south. Haig*s heavy artillery fire held the Huns in check, giving the Second Corps time to form a strong battle line five miles to the south. Much desperate fighting took place on the 24th. A Cheshire regiment, nobly sacrificing itself, held the ridge from Andregnies to Elongues for several hours against overwhelming odds. Six hundred soldiers of the regiment fell in this heroic defence. Meanwhile, Gen. Allenby's cavalry, 10,000 horses, had been ordered to swing over to the extreme left and protect the Second Corps from a flanking movement begun by von Kluck from the west. At Andregnies the cavalry halted, facing the Huns at a range of 1000 yards. Then the gallant Ninth Lancers charged the German flank in the face of a tornado of shell and rifle fire, with no protection from the withering blast. The Lancers were further confronted by double lines of wire, strung within 500 yards of the enemy. Men and horses fell by the hundreds before this withering fire. Only by super-courage were they enabled to save their batteries and make good their retreat. But von Kluck's flanking movement had failed. After a short halt and partial entrenchment on the line Dour-Quarouble, to enable the First Corps to break off its demonstration, the retreat of the Second Corps was resumed, and by the evening of the 24th the whole British Expeditionary Force had reached the prearranged line, Jenlain-Bavai- Maubeuge. time. The First Corps, on the right, was sufficiently protected by the guns of the fortress of Maubeuge. The Germans now began a wide enveloping movement, hoping to coop up the British army in the fortressed town of Maubeuge and capture it entire. In pursuance of this plan, Gen. von Kluck made a deep detour in the west in his effort to outflank the British left wing, while von Buelow was trying to roll up the British right flank. Meantime, in their sweep forward on the 24th, the Germans had captured the French brigade of Marquis de Villaret at Tournai, and a British battery. Gen. French, knowing the danger he incurred in relying upon the defences at Maubeuge, decided to vacate the position. Accordingly, the British army, on August 25, set out on the next stage of its retreat, marching south on either side of the forest of Mormal. The French garrison, however, remained in Maubeuge, holding the fortress against repeated German attacks for ten days and thus depriving Gen. von Kluck of the services of 60,000 troops in the subsequent Battle of the Marne. The British army made their stand in the neighborhood of Le Gâteau, where civilian labor had been employed to prepare and entrench the grounds. There the British were reinforced by a new division, sent forward to assist the retirement of the Second Corps. For both corps it had been a day of torture, marching under a blazing sun along 'roads crowded with transports and packed with refugees. Under these trying conditions, the various units of the Second Corps had marched 20 to 35 miles on August 25, reaching their appointed line on the Cambrai-Le Gateau road as night was falling and in a cold, steady ram. The First Corps, having been delayed, did not reach the allotted position; its units were scattered over a wide area, at some points 30 miles apart, and at no point nearer than Landrecies, eight miles from Le Gâteau. The difficulties of movement had been increased by the convergence of the French troops, retiring from the Sambre, who cut across the British line of march. The enemy's pressure, moreover, had been continued well into the night. The Siege of Maubeuge took place between August 24 and September 7, 1914 when the French garrison of the Maubeuge Fortress finally surrendered to the Germans at the start of World War I on the Western Front. * August 7: General Fournier, commander of the Maubeuge Fortress, accurately warned that a massive German offensive over the Meuse River was likely. 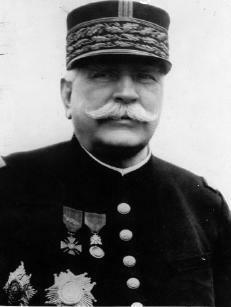 General Joseph Joffre promptly sacked him for defeatism. * August 12: At a British War Council [15:00–18:00], Field Marshal Lord Kitchener predicted a major German drive through Belgium, but was compelled to agree to send the British Expeditionary Force (BEF) to Maubeuge as planned instead of further back to Amiens. 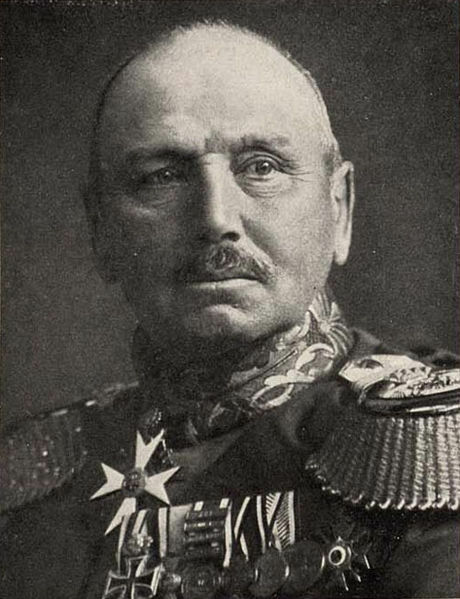 Kitchener ordered General John French not to consider himself under the command of the French Army. * August 20: The BEF was fully assembled around Maubeuge. * August 21: General Karl von Bülow ordered Alexander von Kluck’s 1st Army to veer from moving west to south towards Maubeuge. Kluck angrily objected as this prevented the German 1st Army from outflanking the Allied left. The BEF began marching north from Maubeuge towards Mons - reconnaissance reported that strong German forces were heading straight for it, but the reports are discounted by the confident Sir Henry Wilson. * August 24: Early in the morning John French briefly threatened to retreat away from the Charles Lanrezac's Fifth Army towards Amiens, until he’s dissuaded by Joffre - John French also considered withdrawing the BEF into the fortress of Maubeuge. 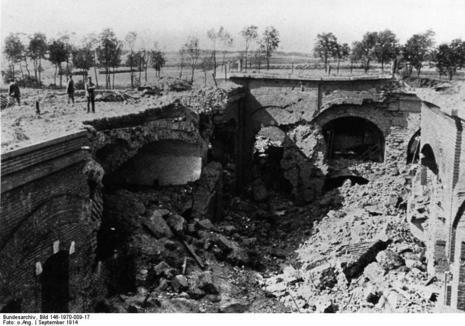 later the same day German Second Army opened its attack on the French fortress of Maubeuge. * August 25: The advancing German Second Army left behind a corps to cover the French fortress of Maubeuge - the fortress commander was ordered to hold on. * August 26: German forces had completely invested the bypassed fortress. * August 29 to September 5: The surrounded French fortress was subjected to bombardment by German heavy artillery. 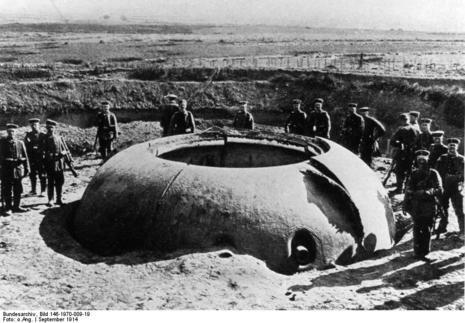 * September 5 to September 6: After a prolonged bombardment, German forces stormed four of the bypassed forts. * September 7: During the evening, far behind the front line, the fortress complex at Maubeuge fell to the Germans, with 40,000 French soldiers taken prisoner. * November 9, 1918: Maubeuge was re-taken by the British Guards Division and 62nd (West Riding) Division.